NIMS Conference 2014 was successully done. We are looking forward to seeing you at the next NIMS Conference! May 27, 14; Satellite Symposium "Nanoarchitectonics for Patient-oriented Future Medical Treatment"
May 22, 14; [NIMS Award 2014] announced. [Detailed Program] updated. May 19, 14; The paper registration has been closed. Thank you very much for a lot of submission. 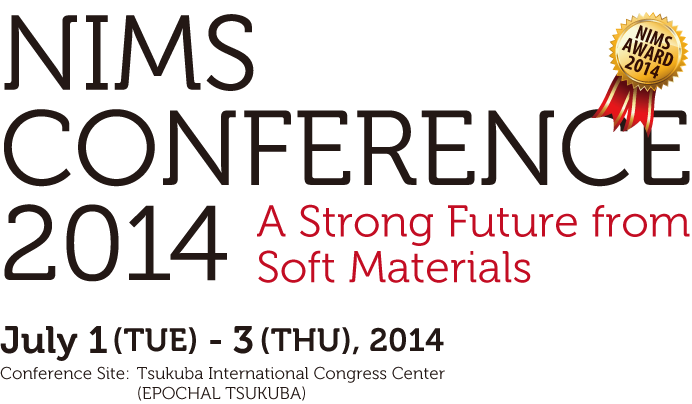 March 20, 14; NIMS Conference 2014 official website opened. "Structure Control of Atomic / Molecule Thin Film and Their Application"
- Back to the Basics -"
"Challenges of Nanomaterials Science: towards the solution of Environment and Energy Problems"
"Nanobio- materials and technologies: breakthrough for future medicine"
"Materials Science for Highly Efficient Use of Energy and Resources"
"Recent Breakthroughs in Materials Science and Technology"
Copyright © 2001-2014 National Institute for Materials Science (NIMS).